This week I ended up with a giant batch of creamed greens and nothing left to eat them with. Actually, I did this on purpose because I had plans for the leftovers. One of my favorite brunch dishes, baked eggs with spinach and leek, got me thinking about how the combination of leftover creamy vegetable goodness topped with a fried egg might taste. The upshot: it’s my new favorite breakfast, brunch, and maybe breakfast-for-dinner. Toast bread slices lightly, then add cheese to bread, and broil for 2 minutes in oven/toaster oven. Fry egg to perfection. 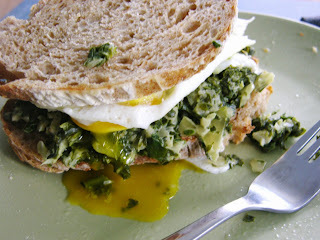 Spread greens mixture on bottom slice of bread, top with egg, other bread. A sandwich appears. Depending on how goopy you like your egg yolks, you may want to enjoy the sandwich with a knife and fork, or maybe just in private with a wet nap. What a beautiful creation. I'm a sucker for runny eggs.